Compete against local bowlers and enter tournaments to win trophies and enhance your prestige. Special charms and bowling balls give you (and your opponents) a strategic advantage. Bowlers and spectators alike will vie for your attention by offering you quests, deals and bets while you bowl. With a retro-style decor, 10 exciting alleys, whimsical characters, and many unique bowling balls, Saints and Sinners Bowling offers countless hours of entertainment. 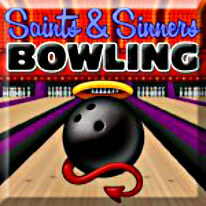 Download Saints and Sinners Bowling today and enjoy the twists and turns of the Bowlers' Tour!